Wonder why you chose Farnham? In 1929 Jean Vigo made the documentary film ‘A propos de Nice‘ in which he depicted the contrast between a monied leisure class and the underclass upon which it depended. In an introduction to his work Vigo stated: “In this film, by showing certain basic aspects of a city, a way of life is put on trial…” I liked the idea of putting ‘a way of life’ up for scrutiny – and I thought that it might be possible to do this with Farnham: I wanted to document the town in an attempt to raise critical questions about its identity and ethos – as well as hinting at the way of life of its inhabitants. I was also influenced by Joan Didion’s more recent examination of life-and-place in her elegant investigation of California. Didion’s work, ‘Where I was from‘ brilliantly exposes the way certain narratives dominate how California is perceived. However, she shows that these narratives are often inaccurate or misleading and fail to reflect certain basic realities. Farnham, too, is not immune to certain narratives that make claims about its identity and these may be convenient ways of masking some unsettling truths. For example, there is a stark contrast in Farnham between rich and poor: the car park at Waitrose (in the very heart of the town) – particularly on a Friday evening – is frankly a remarkable sight: the sheer volume of luxury cars (even Maseratis and Porsches of every swanky fashion) that are parked there are testimony to the indulgences of the rich. By contrast, a general practitioner, who arrived in the town to begin her practice, remarked to me that she ‘never knew there were so many poor people on Farnham.’ Lots of people just struggle on. The windows of the estate agents situated in the town centre advertise houses that are so expensive they simply exist for most in a kind of dreamland phantasy. And, as if to rub salt in the wound, there are some miserable attempts by developers to assert that some of the homes they are now building are ‘affordable.’ Most are not. And even if some homes are a bit cheaper they quickly become choked with cars of the three-car family. Another thing about Farnham that is conveniently overlooked by the deceptions of the marketing ethos is the obvious degradation of the fabric of the town. It has become more and more scruffy. In fact, it embarrasses me. 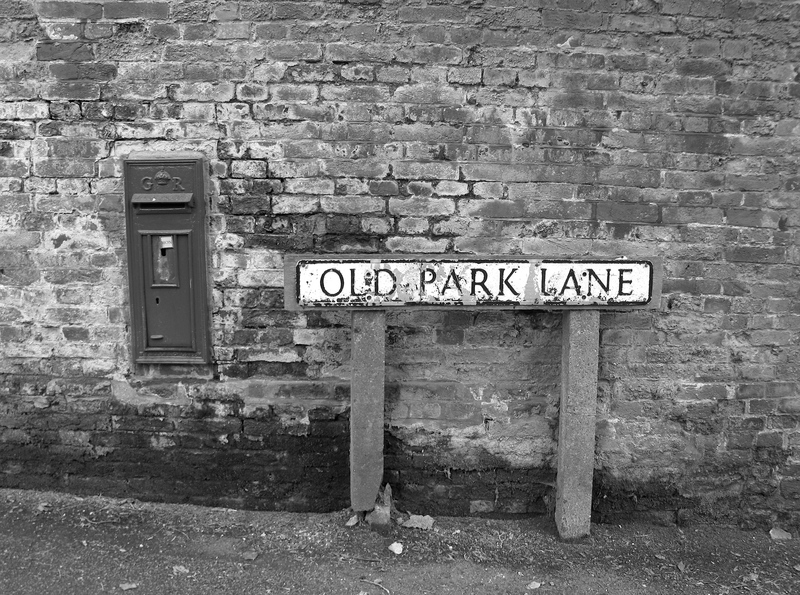 It is possible to ‘read’ a culture through the tiny signs – the micro-details – of its manifestations; so what can we see in Farnham. Well, in my street alone, we have people who park half-way onto the pavement; we have front gardens that no one cares about; we have a large lorry that is parked on a single yellow line in the evenings and which leaks diesel oil onto the street; we have the accumulation of litter and empty bottles and take-away packaging; and we have people who spit and swear and dogs that leave their muck on the pavements – and when you walk down the street you never know if anyone will ever even make way in order to help you pass. (I don’t even hope anymore – I just walk in the road.) The children seem to have a carte blanche to scream and stuff any manner of sweet drinks and grub into their mouths. 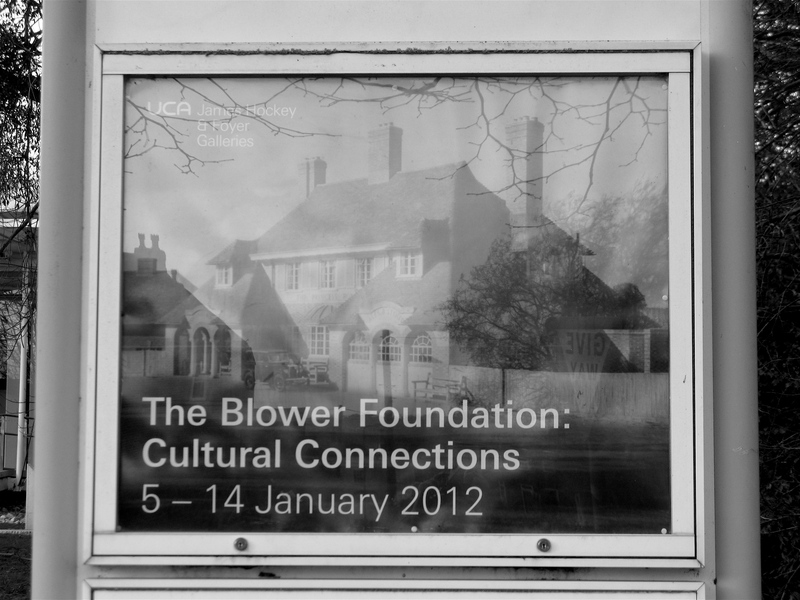 Horrible banners and advertisements for this that or the other are shoved up on the railings – or on lamp-posts. And then this: a child is plonked on the low level wall of my front garden. The mother chats away on her mobile phone. The child decides to destroy the gorgeous flowers of my dahlias. And so it goes on. It’s nicely and logically linked to a wider culture of de-regulation. But another thing is happening that is remarkable: Farnham has gone in for a seeming exponential level of development: dwellings of all sorts are being constructed wherever it is possible to do so; the result is that the character of the town has changed; not only has it become a scruff-bucket but it is also the refuge for the ‘good investment’. The town is there to be exploited. (Set upon.) You can almost hear the mantra of those ghastly ‘location location location’ tv people: What’s the pay-off for purchasing something in this ‘conveniently situated for anything ever invented’ place? (Oh, and by the way, the schools are guaranteed to get your kid into a sixth form college that will furnish him or her with all they ever need for the good i.e. appetitive life.) The roads are becoming choked and the white vans have proliferated as they deliver endless (mainly superfluous goods) to the newcomers (and the old-timers too.) The new dwellings mean that a huge number of small businesses and entrepreneurs advertise their ‘prestige services’ for roofing, extensions, new kitchens, super-duper windows, dog-grooming and so on. Well, I think Farnham has been ruined. I’m ashamed of the place. But it probably works well-enough for the rich and old who gorge themselves in the swanky restaurants and the new younger citizen who is absorbed by technology and who has no memory of a former time when things like courtesy actual mattered. 2. 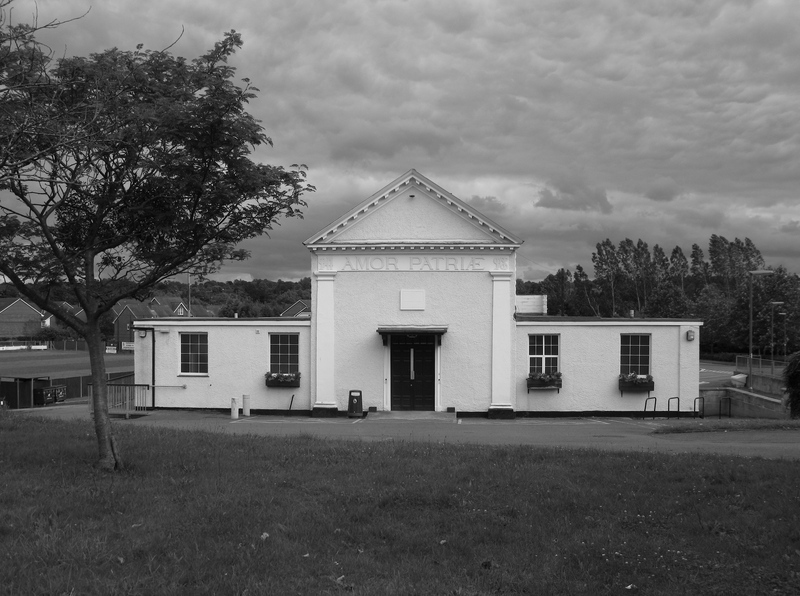 The Memorial Hall is there to remind the citizens of Farnham of its debt to history. It sometimes serves as a polling station when people are supposed to vote for this or that political party or candidate. Some years ago a distinguished labour politician was invited to address the local people. Her name was Barbara Castle. She spoke with verve and passion – but only ten people were present to hear her. The Castle Theatre was replaced by the larger Redgrave Theatre. The Music Hall and Theatre website notes that: ‘The Redgrave Theatre, in East Street, was opened by Princess Margaret on the 29th of May 1974 with a production of “Romeo & Juliet.” This was a modern, purpose-built Theatre, built to replace the Castle Theatre, and named after the actor Sir Michael Redgrave.’ However, The Redgrave Theatre has been closed since 1998; despite some campaigning by local residents, it has not managed to survive. The photograph above shows the south facing aspect of the dead Redgrave Theatre. 5. 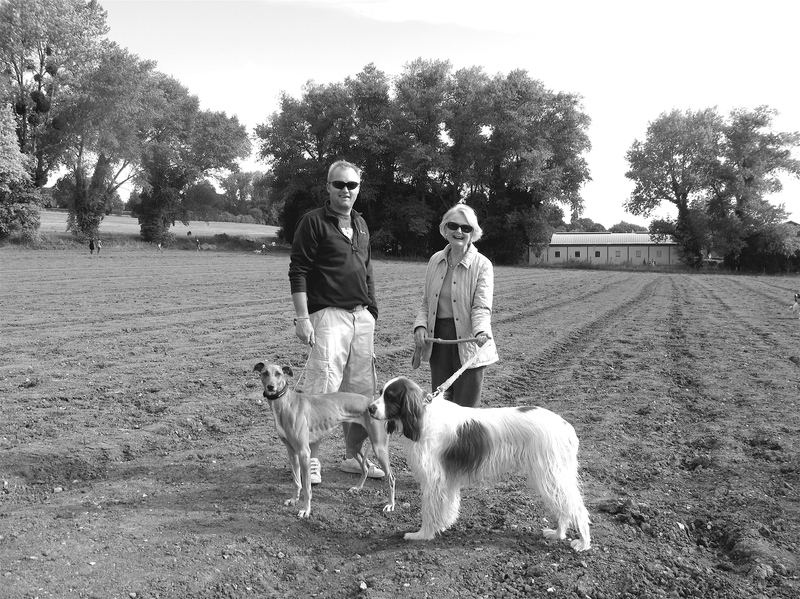 The photo shows two of the demonstrators who took part in the ‘Save our Fields‘ campaign and their two dogs. Dog and master, Dog and mistress – they go well together. The dogs are expensive pedigrees and the people seem well-suited to their dogs. I think the lady on the right is emblematic of the small town. She might well be referred to as a ‘Farnham lady’. 6. This is a kind of antithesis: the photograph shows a building in the centre of Farnham. It is not the sort of building that anyone ever seems to care about; it is not the sort of building that fits in with the official essence and ethos of the town. The building lies in a curious semi-modernist development that includes a number of shops, a café, some building societies and offices; as usual, I have no idea what people do in the offices. Atop the building in the photograph are a number of metallic structures. They resemble modern sculptures and it is possible to get a glimpse of them from a number of vantage points close to the town centre. On sunny days they sparkle and shine. 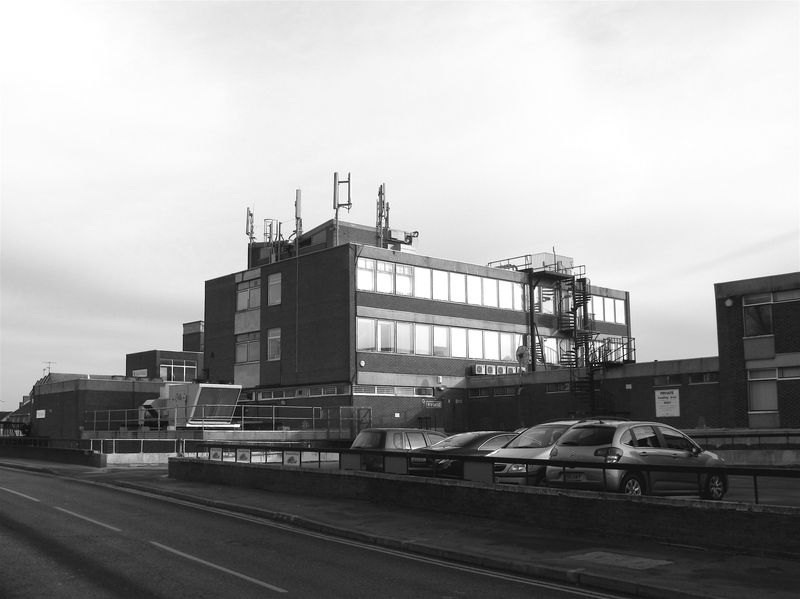 In many ways this building and its rectangular sharp-edged surroundings serve to define Farnham because they are its antithesis; if Englishness was once defined as that which was not French then Farnham defines itself as that which is not like this building. In consequence, the future promises to be a real challenge. It will be a challenge because technology determines so much of how we live and what aesthetically we come to value. The new technologies now dazzle – and generate pixel-people; the comforting and comfortable old red-brick of Farnham may come to look all rather quaint and conservative. Farnham, its predominant image, is really ‘nice’ but it rarely quickens the pulse. 7. Once upon a time a factory called Crosby Doors used to stand on the site shown in the photograph. Crosby Doors actually made things. (Doors – for example). But the whole process of globalisation gradually made its business operation unsustainable and the factory closed down before the millennium. A new kind of building and a new kind of visual environment was then created on the original site of Crosby Doors. The new businesses have names that owe much to semiotics and design – and the spaces around the buildings are watched over by surveillance cameras. The spaces are strangely empty. They are bleak and almost desolate. 8. Every small town has a history and a raison d’etre. Farnham is no exception. Its existence has much to do with its geographical location in relation to London: it was, we are told, well-situated to host a corn market; apparently, in those far-off times, the wagons would arrive from the western reaches laden with their golden cargo and business would be done in the market place. London was another day’s drive away … Farnham also turned its hand to beer-making and all about the centre were situated taverns and public houses – a number of which still remain; others have fallen by the wayside and become ‘locations’ for estate agents or snazzy wine bars. Hop-fields flourished close to the town centre and it is still possible to find hops growing splendidly in the hedges that line the fringes of the footpaths of an old park. Farnham has since seen the emergence of ‘business parks’ and industrial estates some of which lower disconsolately on its outer edges. 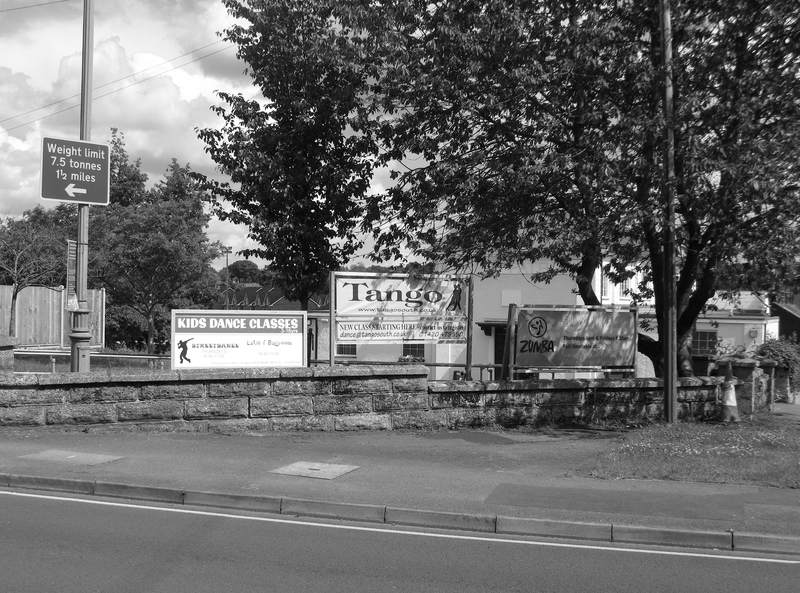 The photo was taken of a piece of the town’s economic history on a hot day in May. 9. 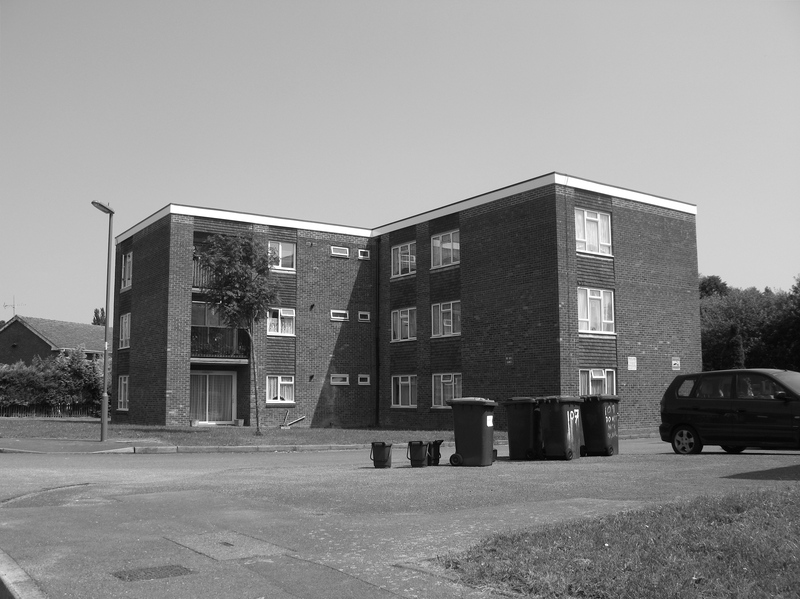 This is a photograph of a block of flats on the eastern edge of the town. One of the large black waste disposal bins has been painted with the imperative: ‘Do not nick again‘. 10. Farnham has gone in for lots of compact high-density dwellings that are designed to be walled-off from the rest of the world. These developments vary in terms of their client groups; some are retirement homes, some are for the well-heeled, some are more modest and may even attract a first-time buyer or two. It’s all part of the new demographics that define people in more and more specific terms such that they can be targeted with more and more effective marketing strategies. Buy or die as it were. 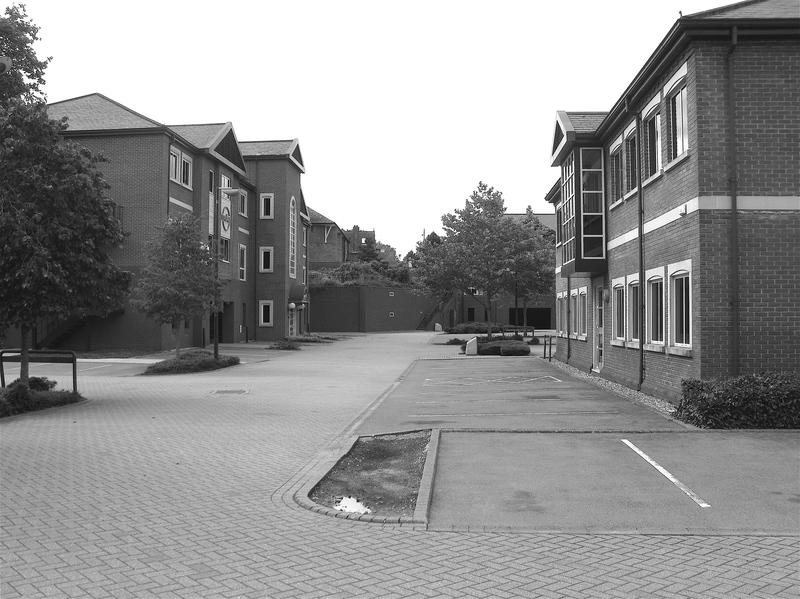 The photograph shows the entrance to one of these new micro-communities that is situated close to the town centre. It is called Blenheim Mews. 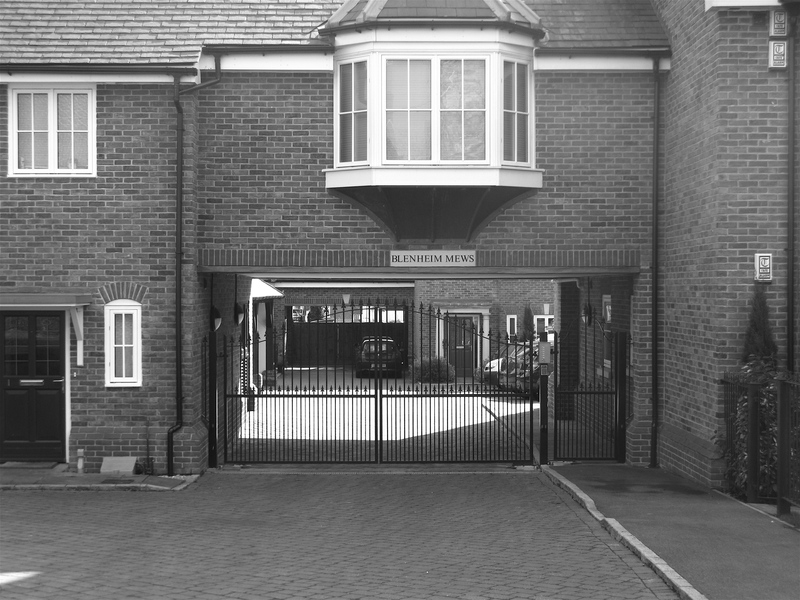 The properties in Blenheim Mews were advertised as ‘superior’ – and so the pretentious name seems fitting enough. The people who live there arrive in swish German cars and use some sort of device to make the gates open. The cars pass through the open gates – which then swing shut again – and no one on the outside catches sight of the life within. 11. 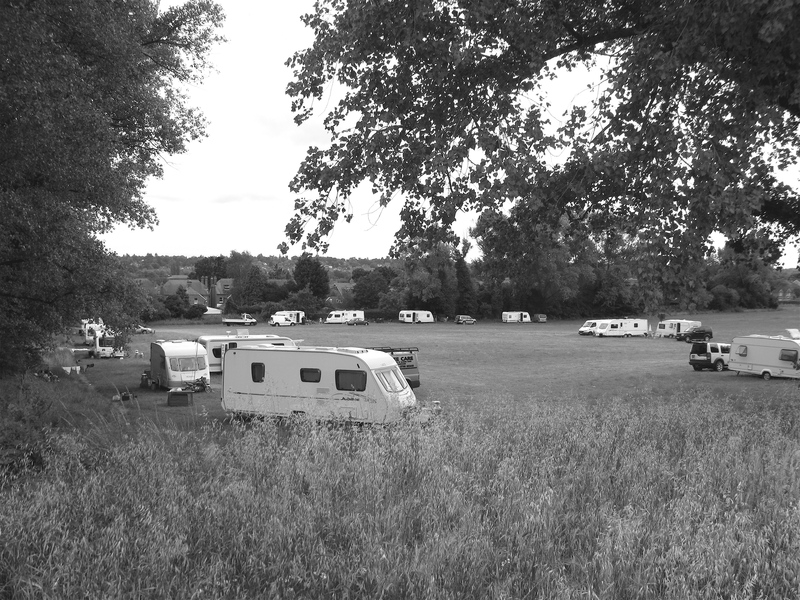 The caravans in the field belong to a travellers’ community. 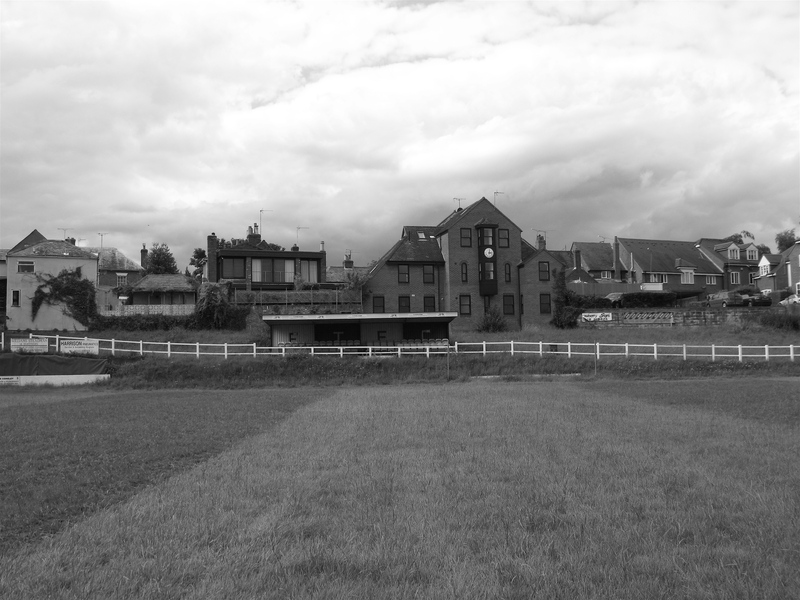 The field lies unexpectedly close to the centre of the town – and is immediately adjacent to the Art College. The travellers suddenly arrived at the height of summer; they promptly installed their caravans and parked their robust 4X4 vehicles in a formation that had faint echoes of the circle adopted by wagon trains in fear of hostilities from Native American people. Dogs – in large numbers – were deployed to deter people from approaching the travellers’ territory. The arrival of the travellers raised very basic questions about styles of life – and the deep issue of cultural relativism. More immediately, the local residents saw the value of their houses plummet like falling stones; the dog-walkers amongst them were no longer able to enjoy free and easy access to ‘their’ field; the travellers (and their dogs) made much more noise than the residents were used to. 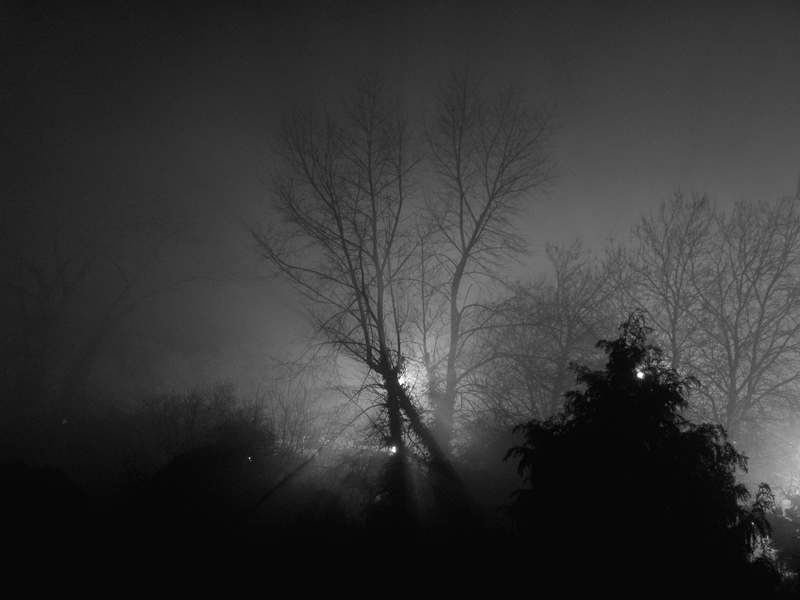 The residents were most disquieted. [Some even re-visited fascist ideas.] How long would the travellers stay? This was the big question. 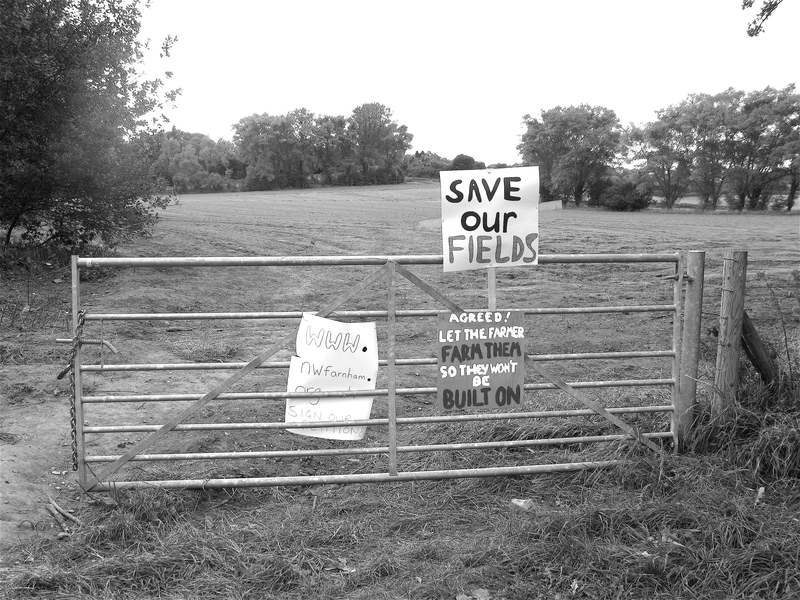 In fact, the farmer who rented the fields (from the owner – a man who lives in Canada) had agreed to let the travellers stay for one week. One week seemed fair enough. It seemed like a good compromise. Yet no one was sure if they would go away. But the travellers did move on when one week had elapsed. However, they did leave a lot of unpleasant rubbish and other horrible waste material behind. This did not endear them to the cultural mainstream. Oddly enough some of the local residents waited for the Council to clear the rubbish away. How strange it is to rely on bureaucracy: it might have taken months to resolve! Others just spent a happy day or two cleaning up the field. 13. 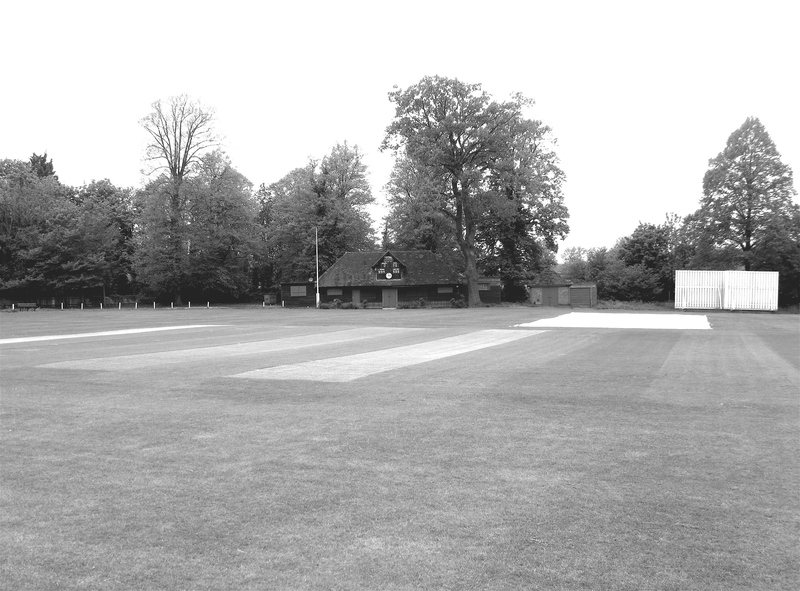 It’s the month of May – and the photogpah shows the cricket pitch that is situated close to Farnham Castle. The white sight-screen, the old pavilion, the huge horse chestnut trees and the soft pale green grass of the newly-mown cricket pitch: the ensemble creates a strangely meditative atmosphere. 14. 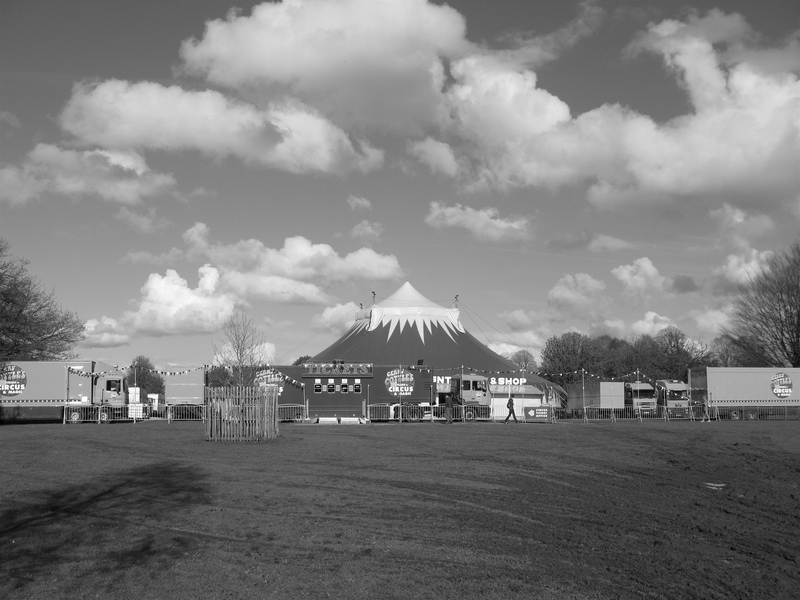 Thank goodness the weather wasn’t too bad on the day the circus came to town. It had been one of the wettest Aprils on record and May hadn’t been that much better. But the circus arrived and set up shop in the park. The huge lorries that transported the equipment as well as all the animals had made deep tyre tracks in the sodden grass. Green grass quickly turned to mud. On the day this photograph was taken it seemed as if some sort of talent show was taking place in the big top. It was mid-afternoon. A girl was singing a rock song; raw and basic: it reminded me of one-act plays like Edward Albee’s ‘The zoo story’. It’s strange to see these relics from the past. Later, when the weather became damp and drizzly the bright lights inside the circus must have delighted the children and dazzled away the real world. 16. Even if Farnham wants to resist the ‘new’ it can’t. Even if it is nostalgic for a golden age – that never was – it cannot withstand the appeal of other cultures and it is increasingly permeated by ‘difference’ and diversity. Tango lessons take place on Sundays in the Memorial hall. 19. The record store in Farnham used to be called Ben’s Collectors’ Records. Ben had another record store in the nearby city of Guildford in which he spent most of his time; since his business was increasingly conducted through the ‘net there came a time when he no longer needed two shops. And so he sold his business to someone else. The record store was re-named 101 Collectors’ Records. There is a wide range of music in the record store and the 33 rpm vinyl records are supplemented by shelves full of the cassettes people used to put into ghetto blasters or car stereo systems. If you go into the record store you can easily get hooked on nostalgia. Once a year the record store participates in National Record Store Day. 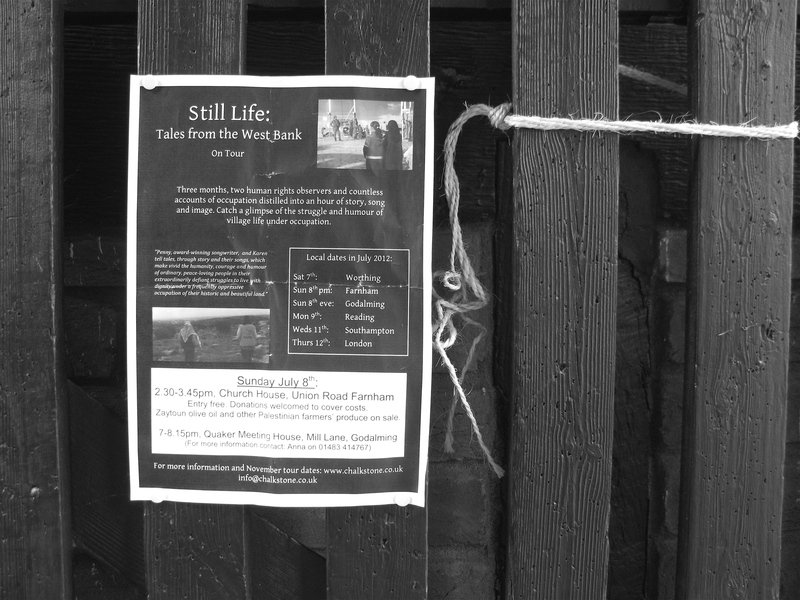 Modest A4 sized posters appear in the town telling of the forthcoming event. 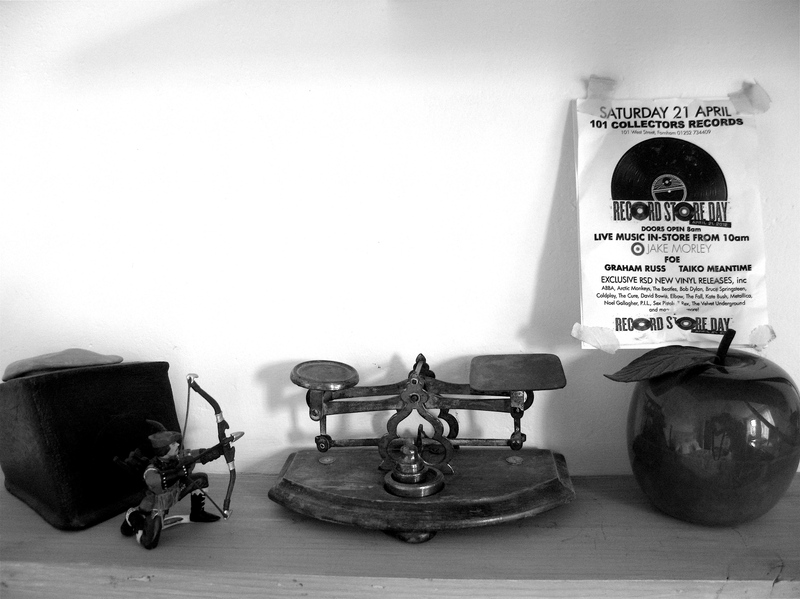 The photograph shows a post-card sized advertisement drawing our attention to the fact that on Saturday 21 April doors will open at 8 a.m. at the beginning of Record Store Day. 20. It would have been easy to overlook this very small poster and not know anything of the event that it was promoting. It tells us about the findings of two human rights observers who spent three months experiencing village life under occupation in the West Bank. These quiet and thoughtful events are not uncommon in Farnham. 21: Front gardens are both public and private spaces: a photographer called Lauren decided to explore the nature of private-public spaces in Farnham. She focused her inquiry on front gardens. She then staged an exhibition that drew attention to the often-dismal quality of those front gardens. Overall, her work was very confronting: some of the gardens she chose to display were given over to nothing much more than concrete or some sort of paving; they were places to park cars and wheelie bins; many were almost devoid of any real care and attention. The front garden (even in Farnham) has achieved a kind of non-place status. How has it come to this? Apart from a few streets that have prized the appearance of their front gardens, why have so many fallen into desuetude? There are bound to be a number of reasons: one of them consists in the fact that people don’t know who may be passing; fear and suspicion lead people to pass quickly into the more protected spaces inside their home or into their back garden. And, related to this is the problem of theft and vandalism; no one quite knows if whatever they have placed in the front garden will still be there in the morning. 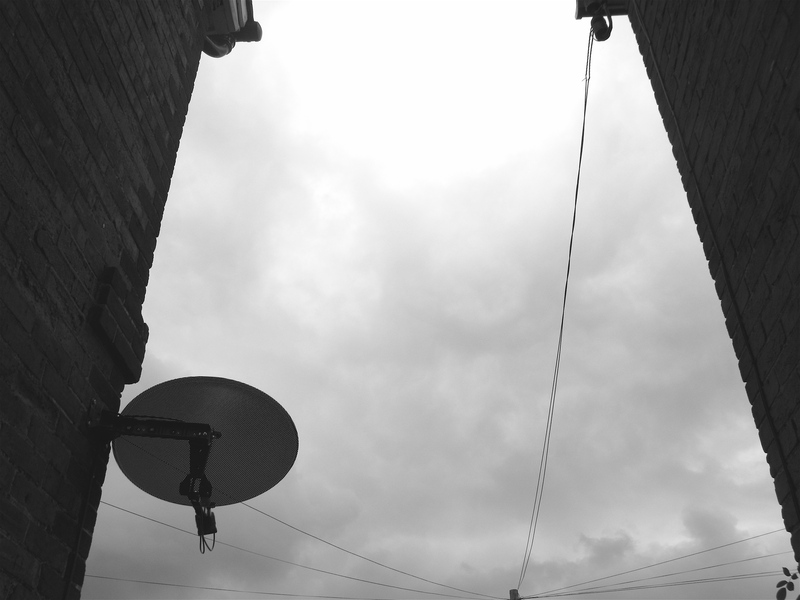 The photograph also suggests another reason: it shows a satellite tv dish attached (reasonably discretely) to a Victorian house; the amazing number of tv channels and programmes provide a continuous distraction, a vector serving to locate people close to the tv screen. Gawping negates gardening. AND the satellite dish is another sign of the times. Its gradual appearance in the small town of Farnham might even contradict Farnham’s brand image as an arts-and-crafts Mecca. 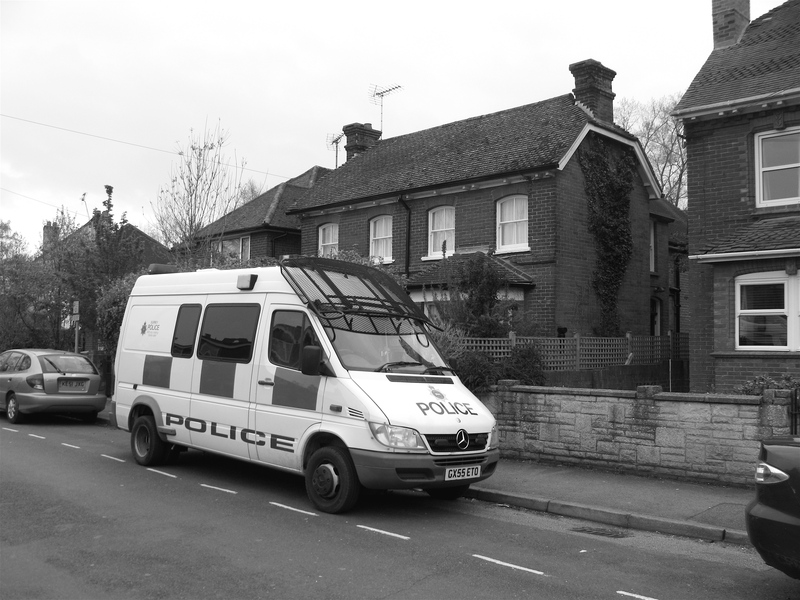 23 .The photograph shows a large police van parked outside a brick-built detached house. The house is unremarkable and, although pleasant enough, has no particular architectural merit. BUT because it is situated in the heart of Farnham (on a level walk to the shops and cafes, the library, the post office, the Arts centre etc. etc.) 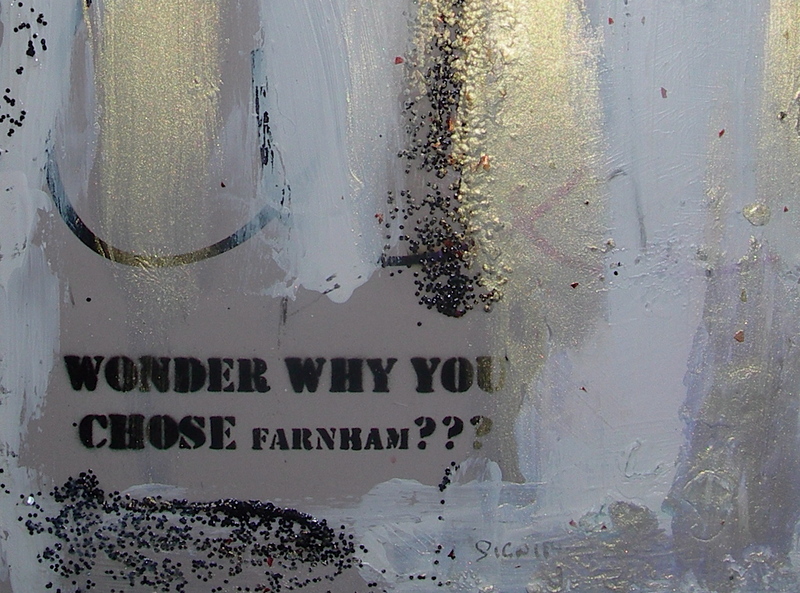 and because Farnham has a certain cachet it would cost more than £600,000 to buy. 24. 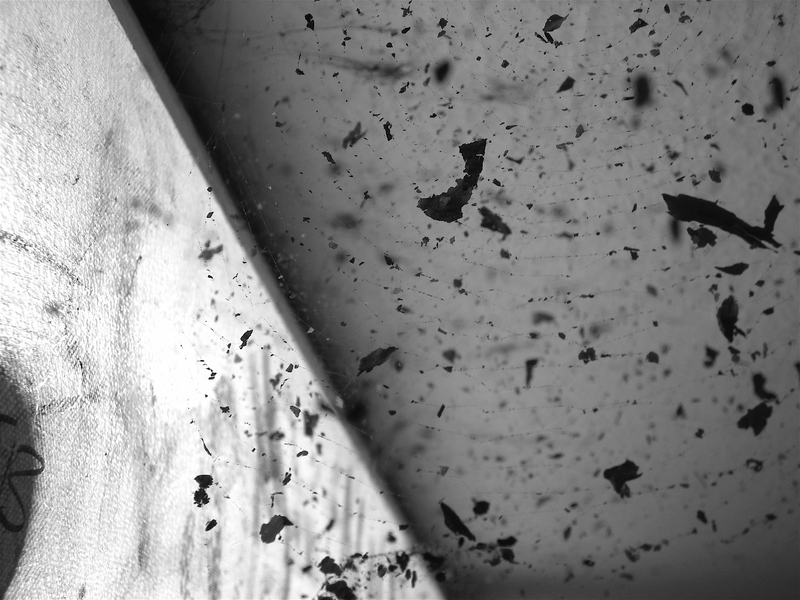 The photograph shows ash caught in a spider’s web. It looked beautiful. The ash had floated upwards when someone had set fire to a super-market trolley in an underpass in the town centre. 25. The foxes are out; the cats too. An owl moves silently across the sky. What will tomorrow hold? And, is Farnham dreaming? The town of Farnham in Surrey could easily be chosen to symbolise some of the typical and enduring features of Englishness. It has a style and manner that is apparently traditional and somewhat restrained. It reflects class divisions but it also expresses aspects of a new classlessness. It is the kind of town that the presenters of TV property programmes say ‘has it all’; The town is thought to have ‘everything going for it’: it has good schools, a variety of pubs, trendy cafes, delightful restaurants and some of the best architecture in the south of England. It is within easy reach of both London and the south coast and, because of its geographical location, it has a relatively benign climate. In fact, in March 2013 Farnham was named as one of Britain’s ‘nirvanas’ in the Sunday Times’ guide to the ‘best places to live’ in South East England. The town has been the subject of a number of works of literature including one entitled ‘Townscape with figures – portrait of an English town’ written by the sophisticated and probing Richard Hoggart. Other books take pleasure in picturing Farnham’s history and, overall, Farnham emerges as a quietly pleasant town, embracing a conservative ethos. It provides a stage upon which a seemingly benign version of Englishness is enacted. 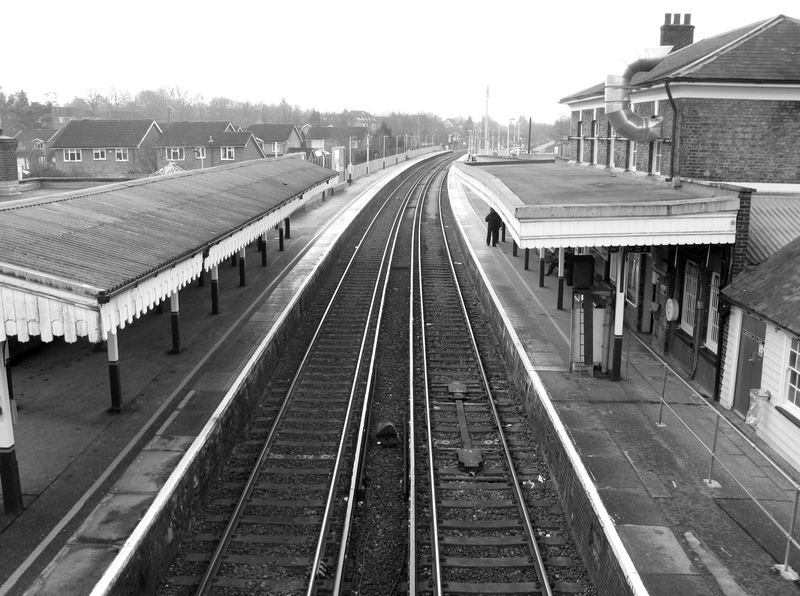 So, in response to my dissatisfactions with the narratives about Farnham, four years ago I began an inquiry in which I set out to make sense of the town. I tried to follow Jan Morris’s advice that the best way to understand an urban environment is to be ‘present’ and alert to the data of the senses. 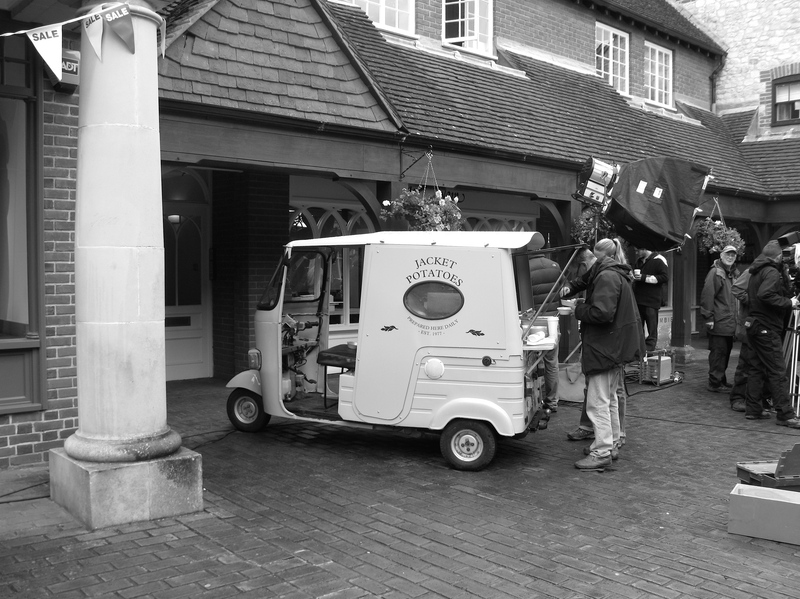 I used a relatively simple camera and made a few notes in the search to discover a way of presenting Farnham as a small town that would do justice to its character, to its contradictions and tensions and its moods and values. I wanted to be critical too. (Some of the text which accompanies the photographs has an undisguised critical tone.) I also wanted to draw from theory – and to recognise that it is largely through developments in technology that the broad aspects of social and individual change are wrought. Nothing is immune to technological development. (One of the reasons that people rarely appear in the photographs is that, because of the new technologies, they are often ‘somewhere else’.) 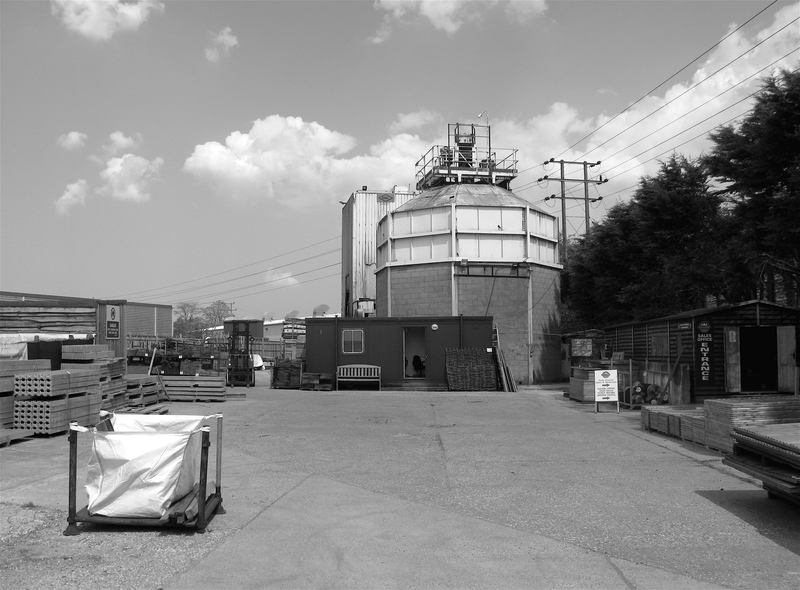 The following 25 black-and-white photographs represent 25 tiny case studies that, taken together, tell a descriptive story of this West Surrey town. 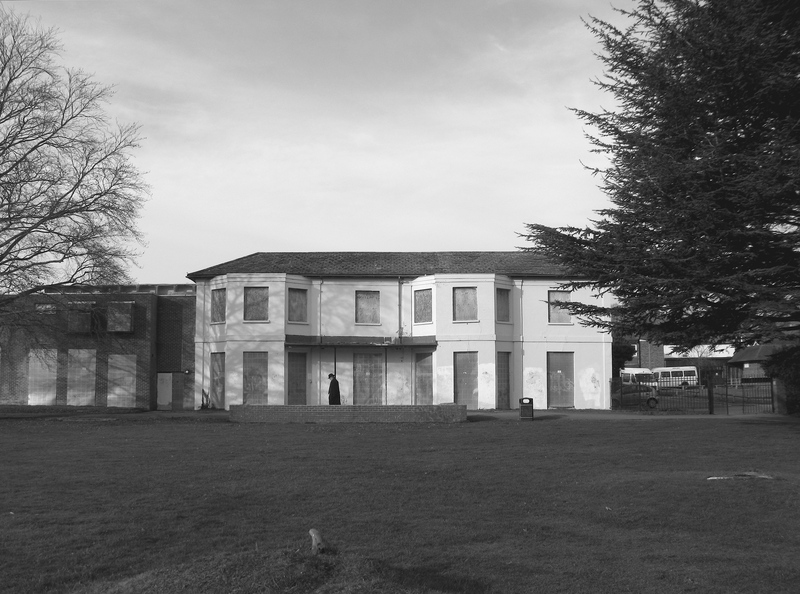 One aspect of their apparent ordinariness is that they suggest a contrast between the external world (familiar and unexciting) and the inner psychological world of Farnham’s residents – a world that is full of images, currents of emotions and problems to be solved. At present the photographs serve as a summary statement of a work in progress.